Green Greens in Super Smash Bros. Ultimate. Green Greens is a level in the Kirby series and is also a stage in Super Smash Bros. Melee, Super Smash Bros. Brawl, and Super Smash Bros. Ultimate. The level layout is quite simple: one center stage and two smaller stages are the main platforms. The center stage is separated from the mini-stages by blocks. 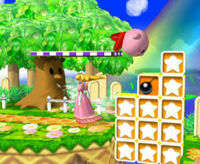 This stage shares some similarities with Dream Land, a stage from the first Super Smash Bros.
Whispy Woods, a huge tree blows a strong gust of wind that can blow players away. Also, blocks and bomb blocks fall from the sky in between the stages. Apples sometimes fly from Whispy Woods' branches. Some apples restore the players' health and some can be used to throw at the other players. The Super Smash Bros. Melee version of the stage's music appears in the PAL version of Donkey Konga 2. There is a small glitch in this stage, where if Olimar throws a red, blue, or white Pikmin at the blocks, they will get stuck on them and will stay there indefinitely until an enemy touches them or the blocks are destroyed. This page was last edited on December 11, 2018, at 01:02.